What's the yield effect of uneven corn heights? Many corn fields across Iowa had significant variation in plant emergence and early-season growth within fields. 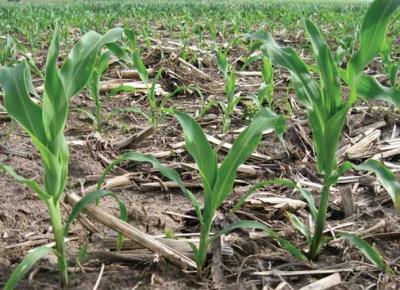 Uneven emergence and plant heights are caused by several factors, including variation in soil temperature, seeding depth, residue distribution, soil crusting, and soil moisture, etc. Iowa producers dealt specifically with variable soil temperatures this year, which have now caused variable plant heights and vigor. How much can plant height vary before it causes a real yield loss? And based on this, should we have replanted more? Four percent of Iowa's corn acreage was replanted this year (National Agricultural Statistics Service [NASS], 5 June 2006). In general, non-uniform stands result in lower yields because the smaller, late-emerging plants cannot capture enough sunlight. Unfortunately, the yield loss from the "late" plants is not made up by the "normal" plants. We compiled research from scientists in Europe, Canada, Minnesota, Wisconsin, Illinois, and Argentina to determine how later emerging plants performed within a field of normal emerging corn. These studies are typically conducted by delaying planting of a certain percentage of plants within the field to simulate variable emergence. Within this article, we will refer to "normal" and "late" plants. These refer to seed that was planted on a typical or normal planting date versus corn planted into the existing stand at a later time. Most of the research reported within this article is also in Figure 1, which shows percent yield loss due to uneven emergence. Figure 1. Compilation of research results showing percent yield loss when a certain percentage of the stand (x axis) is late compared to the rest of the field. Arrow colors represent which research report they are from. Populations are embedded within parentheses of the references (26 to 32K where K is 1,000 plants per acre). European researchers found that corn planted either when the normal seed had germinated or when it had already emerged resulted in reduced yields (Pommel et al., 2005). The later emerging plants had smaller leaf widths, less leaf area, less total biomass, and less yield than the normal plants. Leaf area is a measure of how much leaf is available to capture solar radiation and was measured throughout the season. It varied somewhat early in the crop development between treatments. By the time that approximately 850 growing degree days (GDD) (refer to How and why we measure degree days [5/17/2004]for how to calculate GDDs) had accumulated, the normal plantings always had greater leaf area values than the later emerging plants. Corn will be at approximately V10 once 850 GDDs are accumulated. Therefore, if plants are small once they reach 850 GDDs, then they will always be behind. 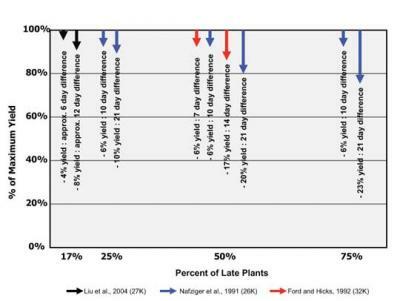 Canadian scientists found that when one of six (17%) plants was delayed in emergence by two leaves, overall yield was reduced 4 percent; when delayed by four leaves, 8 percent yield losses were observed (Liu et al., 2004). They targeted a plant population of 27,100 plants per acre. Plants neighboring late-emerging plants only partially offset yield losses of the dominated plants. Plants located near gaps in the row did compensate for the gaps. Illinois and Wisconsin researchers looked at the response of corn when 25, 50, or 75 percent of the plants were planted either 10 or 21 days after the original planting date (Nafziger et al., 1991). Final stands were 26,100 plants/acre. Overall, grain yields were reduced 6 to 7 percent by a delayed planting of 10 days regardless of the percentage of plants delayed. However, when planting was delayed 21 days, yields were reduced 10 percent when 25 percent of the plants were delayed, 20 percent when 50 percent were delayed, and 23 percent when 75 percent of the plants were delayed. Minnesota scientists compared corn planted normally to that where half of the seeds were planted either 7 or 14 days later (Ford and Hicks, 1992). Normal plants had larger stalks, more tillers, longer ears, more ears, fewer barren plants, and more grain per plant than late plants. Yields were reduced more with a 14-day delay than with a 7-day delay (Figure 1). 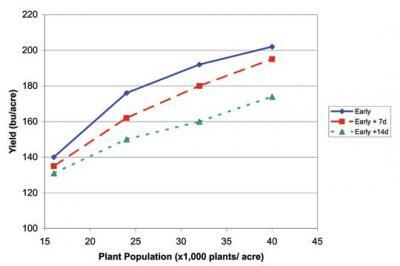 Only at lower populations did they see small differences between the stands; as yield increases, the later plants caused greater yield reductions (Figure 2). Figure 2. Corn yield averaged over years at Lamberton, MN, as influenced by planting date and plant population. Early = all seeds planted in early May; Early + 7, half of seed planted in early May, half 7 days later; Early + 14, half of seed planted in early May, half 14 days later (adapted from Ford and Hicks, 1992). Late-emerging plants are not compensated for in corn as in soybean (Andrade and Abbate, 2005). Attaining uniform corn stands is more important because it has lower vegetative plasticity; i.e., corn is less able to compensate than soybean. Corn hybrids do differ though among one another in their ability to compensate, and, therefore, yield is determined somewhat by hybrid characteristics. Wisconsin and Illinois researchers concluded that even though late-emerging plants reduce yield, replanting would not increase yield potential unless more than half of the plants were delayed by three weeks or more. We agree with these findings and highly doubt that replanting would have resulted in increased yield for fields that have variable emergence and plant heights. Although yield potential is compromised in these fields, the best decision was still to leave the crop as it was. To estimate what you may expect for yield loss in your fields, please refer to Figure 1. Estimate the percent of your stand that appears smaller than the normal plants; this is your x-axis value. Next, try to estimate how many vegetative stages the plants are apart, on average. Take this value and multiply it by three to derive an approximation of how many days separate the normal and late plants. Use these values in Figure 1 to derive a fair approximation of percent loss for your field. We are aware that fields exist in which the corn is actually at the same growth stage; the uneven appearance comes solely from a variation in plant height. We are not aware of research data that specifically simulates this type of growth. A yield reduction should be expected, but the severity of it cannot be known for sure. Andrade, F.H. and P.E. Abbate. 2005. Agron. J. 97:1263-1269. Ford, J.H. and D.R. Hicks. 1992. J. Prod. Agric. 5:185-188. Liu, W. et al. 2004. Crop Sci. 44:847-854. Nafziger, E.D. et al. 1991. Crop Sci. 31:811-815. Pommel, B. et al. 2002. European J. Agron. 16:263-277. This article originally appeared on pages 169-171 of the IC-496(15) -- June 12, 2006 issue. What is the best seeding rate for corn based on seed prices and yield level?